Low-carb high-fat (LCHF) diets are undoubtedly effective for weight loss, but we can do even better by adding intermittent fasting, which offers many advantages not offered by conventional dieting. Both diets have the same goal, which is to lower insulin effect. While many believe that calories causes weight gain, that is simply a myth. Insulin is the main driver of weight gain. LCHF diets lower insulin rather than calories and therefore are effective weight loss diets. However, fasting does even better than LCHF so the two may be combined for maximum effect. 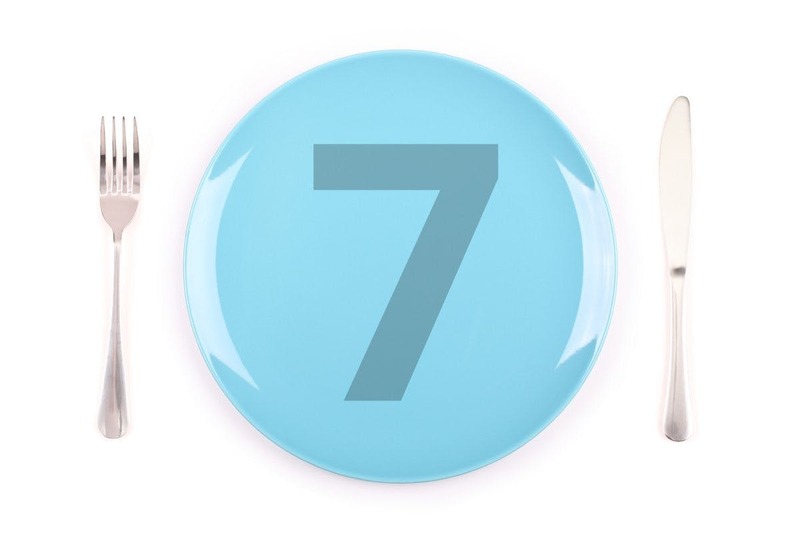 Here are my top seven advantages of fasting. LCHF diets are not always easy for people to understand. Many foods contain hidden sugars in the ingredient list. People may not always understand the differences between carbohydrates, fats and proteins. To make it even more complex, carbohydrates differ in their fattening potential. What about fibre? What about the concept of net carbs? What about resistant starch? The questions are endless. It is difficult enough for a well educated English-speaking, computer-literate person to adopt a strict LCHF diet. Not only that, but there is all that conflicting advice flying around the internet and the airwaves. I would often advise people to adopt a LCHF diet only to find food diaries full of whole wheat bread and plates of pasta. Many people honestly did not understand the diet at all. I spent lots of time and grey hair trying to change their diets, but many people simply did not understand. Furthermore, their diets had not significantly changed in 40 years, and they were having a lot of trouble changing it. The Low Fat diet has been indoctrinated into people for the last 40 years, so they found it difficult to incorporate lots of healthy natural fats into their diet. A completely different approach such as fasting was much easier for people to understand. Fasting itself, is so simple that it can be explained in two sentences. Eat nothing including sugars or sweeteners. Drink water, tea, coffee or bone broth. That’s it. Even with this simple method, understanding the intricacies can take hours of explaining. But that does not mean they should be doomed to a lifetime of type 2 diabetes and disability. Fasting is free. Actually, it is not simply free, but it actually saves money because you do not need to buy any food. Nothing beats free, except, of course, saving money. Who can’t use a few extra dollars in their pocket while losing weight and getting healthier at the same time. It’s like you are being paid to lose weight! Eating a home cooked, prepared-from-scratch meal is terrific, but there are many people who simply do not have the time or inclination to do so. The number of meals eaten away from home has been increasing over the past few decades. While there are many who try to support the ‘slow food’ movement, it is clear that they are fighting a losing battle. So asking people to devote themselves to home cooking, as noble as it may be, is not a winning strategy. Fasting, on the other hand is the opposite. You save time because there is no time spent buying food, preparing, cooking and cleaning up. It is a way to simplify your life. I often skip breakfast in the mornings. Man, the time saved! I often skip lunch, too. Man, the time saved! If time is money…. Where many diets complicate your life (eat this, but not that, and only a little of the other), fasting simplifies it. Save time and save money? It just doesn’t get any better. It’s not practical to advise people to never, ever again eat ice cream. Sure, you might be able to swear off of it for 6 months, or 1 year, but for life? And would you really want to? Think about it. Think about the joy of savouring an especially delicious dessert at a wedding feast. Do we need to deny ourselves that little bit of pleasure forever? Let us all enjoy our birthday salad feast! Thanksgiving kale festival! All you can eat brussel sprouts! Yes, life just got a little less sparkly. Forever is a long time. You can’t eat dessert every single day, but fasting gives you the ability to occasionally enjoy that dessert because if you feast, you can balance the scales by fasting. This is, after all, the cycle of life. Feast and fast. ‘Cheat’ days are important because they build compliance for the other days. Simply put, it makes the diet easier to follow and changes it into a lifestyle instead. The most important aspect of fasting is to fit it into your life. Life is intermittent. There are good days and bad days. There are days to celebrate and days to dread. That’s life. Your diet also needs to be intermittent. There are times to eat a lot and celebrate. But there just as surely needs to be days where you fast, to make up for it. Losing weight is hard. Everybody knows that. The most important question of any dietary intervention is this – will it work? The caloric reduction diet sounds like it should work, but does it actually work? The answer is no. Certain diets work tremendously for some people but fail utterly for others. Sometimes, diets work for a period of time, and then seem to stall. Alone among dietary interventions, fasting is almost universally effective, since it is the fastest and most efficient way to lower insulin. It also contain almost unlimited power. What do I mean? Some diets have only 1 ‘power’ setting. If you follow the Mediterranean diet, but fail to lose weight, then what? How do you become more ‘Mediterranean’? It’s impossible. There’s only one power setting and it either works or it does’t. Not so with fasting. You can simply continue fasting until the weight you desire if lost. The world record for fasting is 382 days, so there is unlimited power. Fasting can be done at any time and in any place. If you do not feel well for any reason, you simply stop. It is entirely reversible within minutes. Consider bariatric surgery (stomach stapling). These surgeries are done so that people can fast for prolonged periods of time. And they tend to work, at least in the short term. But these surgeries have tons of complications, almost all of which are irreversible. There is no set duration. You can fast for 16 hours or 16 days. There is no set schedule. You can fast a lot this week and none next week. It can change with your life’s schedule. You can fast for any reason or no reason at all. Simple. Saves money. Saves time. Flexible. Powerful. Available anytime, anywhere. What could be better than that? Do you you want to learn more about fasting from Dr. Jason Fung? Check out our new video course. The first part is freely available for anyone. Dr. Fung answers questions weekly on our membership site. The most interesting questions and answers so far are now available to everyone. Boy - if there ever was an example of comparing apples and oranges this is it. I don't think that pitching fasting as a diet form on it's own is helping the underlying positive intention. Nor is stating that "if you're poor, you can still fast", that's actually cruel. Following this train of thought you could solve 3rd world diet issues by recommending them to fast instead of eating (or keep doing it as they have so much experience with fasting). Fasting is the absence of eating and it helps the well- or overnourished body to take a break from digesting every once in a while or even regularly. End of story - no need for yet another 30 min podcast / video lecture on it. And cheat days - really? Why didn't you also add that everything in moderation is good? You really think that fasting will issue you "go eat some crap" vouchers to use at your leisure? Is it ok to put a 1/2tsp of coconut oil in my coffee when fasting? You obviously didn't read the part about the difference between fasting and starving. The fact that fasting is a choice and you have control over when you start and especially when you stop. You can CHOOSE to start eating whenever you feel. People in 3rd world countries to not have a CHOICE to start eating because they do not have access to food. Talk about creating a false issue and then attacking it. Secondly, I myself have lost my jobs and therefore my income and it has been a choice to decide to eat less food so that I could spend that money for food on my cats who have no say in the matter. They want to eat, they don't understand fasting, I do. So, fasting has helped me save money. And YES, I count as over nourished so I could stand to lose a few pounds of bodyfat. Yet I still have access to food, even being poor. Lastly, Yes, I can enjoy a slice of pizza with my BF without feeling guilty, but I don't eat pizza everyday so while I would not necessarily call it a cheat but an indulgence, I probably would be more wary to have it if I were only low carbing. In fact it's actually easier sometimes to just say no to indulgences if I'm feeling good and energetic in the middle of a fast. I have done low carb and even while low carbing I have fasted some days without thinking about it, just because I was busy and my body just let me roll with it. I'd often do 14 to 18 hour fast spontaneously and then I'd go home and have a low carb dinner and feel fine. I don't know what your problem is with fasting or this article, but if you don't like his articles or podcasts then just don't read them. He puts them here for those of us who want and need them. No need to comment in order to bash them. If you have some actual facts or studies or experiences that counter the information then show it or blow it. I have been on this diet for 8 months. I don't have cheat days, but I don't miss out when there's a special occasion. I have eaten ice cream on a couple of occasions and had a piece of cake when it was made especially for me. Don't hurt people's feelings when they've taken trouble to prepare something for you. My son's wedding is coming up, and I intend eating what everyone else eats! This is not a problem. I have reached my goal weight and find it easy to maintain on this diet. There is nothing, but NOTHING negative that can be said about intermittent fasting. Being overweight and having the ability to eat randomly at any time of the day is obviously a 1st world issue, having nothing in common with people who are genuinely starving. The choice not to eat is made so much easier by the fact that when one eats, once a day like myself, if one is free to eat what one wants, there is never a feeling of being deprived which is the problem with probably 99% of diets, and the reason they fail. When I'm with friends or family I do what they do, not wishing to impose my lifestyle upon them, because tomorrow is another day, I'll just go back to my intermittent fasting when I'm free to do so. The fact that I enjoy meat, good fats, plus organic whole fruit and veg, is my personal bonus. In time it gets easier to make better choices, and have smaller servings too because the stomach just can't take in as much as it used to. The weight-loss has been dramatic and saving of time and money beyond compare. Its the way to go! When on top of that one reads the science of autophagy, Armin I'm afraid you come off looking as if you are shooting your mouth off without taking in all the info first. There is always one (referring to the negative comment at top) Thank god I came across this man, he has helped me more than he will ever know. It's everybody's choice whether to believe in him or not, but I chose to believe in him, and I am seeing great progress, and feel so much healthier for it. Thankyou sooo much Dr Fung, all your advice is very much appreciated. I have been intermittent fasting for four months now and have lost 18 lbs. I have never had results like this and I intend to continue this for the rest of my life. It has already lowered my blood pressure and sugar levels. So glad I found this new attitude toward food and I would recommend it to everyone! I am new to this, but have been using the 8 / 16 fasting method for about 2 weeks and have gone from 230 to 224 without really changing anything that I am eating. My questions involves eating after working out. I get home around 4 and eat right away, so I can eat breakfast around 8. Frequently during the week I strength train between 5 and 7. I have always had a little something high in protein after training. I am wondering if it will hurt muscle growth if I stop eating something after my workouts? I have read that if you train hard enough your body will start taking away muscle instead of fat if you don't eat something after working out. Please let me know if it is okay to skip the protein after working out or if I should change my fasting to accommodate 16 hours between my protein and next meal. Thank you! When I was in college (1970s), I tried fasting during finals week in my senior year. I also worked full time while in school, and took my "vacation" during finals. Instead of exams, most of my classes required papers. I fasted on water only for a week and, after the first day, I had lots of energy; completed all my research and papers; slept for a few hours at a time, and generally felt great. So were my grades. I lost weight (which wasn't my objective), and went back to my generally healthy eating lifestyle after that. I maintained a healthy weight for many years. I'm going back to intermittent fasting at this point of my life to lose weight and get healthy again. Thanks for this article; it has given me incentive. What is the biggest issue that people have with any diet? Sticking to it and not cheating. Well, when fasting, it gives the person the control and will power because once they have felt hungry and have waited for 4 or 8 more hours to eat, they have regained control over their urges. The more they do this, the more control they have and confidence they have to stick to it. For me, it is a tool to regain self control. OK, after reading everything that I was compelled to read, I am convinced that there is quite a lot of validity to Dr. Fung's articles on IF, so I'm going to try it! I am affected by hypothyroidism, which I know definitely causes my extra 30-35 lbs to hang-on a little more tenaciously than someone whose body is naturally regulated by a high-metabolism, but I also blame myself for lack of willpower associated with snacking well after 7:00 p.m. And it's definitely not fruit that I am snacking on! So, I'm going to give the 16:8 fasting method a try! I'm excited to see what results I will experience the first month. And what's up with the first commuter, anyway? Did they even READ the posted article? I have been on intermittent fasting for a while and I am in the third day of a 5-day fast (first ever!) So far so good. I have not yet felt any hunger pangs. Glucose levels are stable (mid-80s) but ketones are higher (closer to 2.0) than usual (0.3 to 1.0). My energy levels are good, and I am not fantasing about food 😄. I’ve read that the first meal after a multi -day fast is important. But I have not found any concrete examples about what foods would be considered optimal for a refeeding meal. Could the Diet Doctor team post some ideas? Thanks! I have been doing IF on an off since January and definitely feel the difference in energy and weight loss when I am fasting. It works for me and my lifestyle and is convenient that I can stop and start it anytime. I found I cannot go back to eating breakfast, lunch and dinner plus those snacks in between as it makes me feel heavy and bloated and is a horrible feeling. I start fasting at 7pm and have water, tea or coffee until 1pm the next day plus I do a HIIT session early every morning and I just feel fantastic. I am trying to get to achieve the one meal per day (dinner). My mother has diabetes and is overweight and we tried IF together for a week when she visited me, so now she's been slowly incorporating fasting in her lifestyle. I am Type 2 diabetic. If I do IF should I take my meds just as I would normally,Dr Fung? I started the HFLC and also Intermittent fasting and watched all of Jason's Videos and lost 29kg in about 12 mths. I would generally do 3x 24 hr fasts a week and maybe a 36 hr one,not hard.I think Intermittent fasting is the key to weight loss.I am a 62 yr male was 135 kg needed to get my weight in order and stumbled onto Diet Doctor,read about intermittent fasting,then watched Jason's Vids and was convinced that was the path to take and it worked for me.Never felt better, 106kg and feel so good. Curious to the answer of your question. If you are on medication please ask your physician about medication dosage and timing. Ideally you should avoid overexertion on a fast day - BPM should stay below 120 if at all possible. As I understand the physiology, if you go into the exercise zone (BPM > 120) then your body will recover energy from muscle mass rather than fat. If you do exercise, you should ensure that you fuel before (protein-heavy ideally), and refuel within 30 mins. For example, if I have a two day fast, but want to train on the evening of the second day, I will have a protein shake before the exercise, and then protein shake / meal within 30 minutes of the end of the exercise. This will ensure that you don't lose hard earned muscle.